If your body is shaped like anything but an elongated rectangle, you likely understand the problem with dress shirts: they never fit quite correctly. As this website constantly argues, the usual answer to this problem is to get an off-the-rack shirt tailored, but doing so isn’t a perfect solution. Perhaps to address this issue more directly, a new market is cropping up – made-to-measure shirting available online from foreign countries. Made-to-measure shirting is far from new, but it has now become more available than ever before, and it is highly tempting to experiment with. By far one of the most popular made-to-measure outfits online is Modern Tailor, a fast-growing mens’ made-to-measure outfitter that sells made-to-measure shirts, suits, jackets/blazers, vests, pants, and the like. 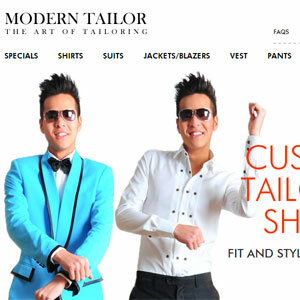 Modern Tailor is something of an awesome little company — it not only provides made-to-measure suiting for classical dress, but also has the flexibility go go wild and (at the time of writing this) provide a Gangnam Style collection for whatever reason. Needless to say, Modern Tailor has had our eye for quite a while, and it’s about time I mercilessly over-analyzed one of their shirts. Modern Tailor is a fairly standard made-to-measure outfitter. Placing a new order takes about 20 minutes, which consists of picking out the style of shirt (from an absolutely drool-worthy array of options regarding everything from collar style to cuff style to placket style), picking out the fabric of the shirt (from a freaking insane number of high-quality fabrics), and measuring your sizes. Everything about the process is straightforward and easy, but it has the level of detail that provides even the pickiest people (i.e. me) satisfaction. Suffice to say, there is absolutely nothing to complain about on the ordering front. Modern Tailor’s measuring system, while time-consuming, is very straightforward. Modern Tailor is smart enough to guide you through the self-measuring process, and even allows you to input the measurements of a well-fitting shirt (instead of your body) if necessary. This is absolutely phenomenal, no complaints there. Pricing is also fairly straightforward — fabrics are tied to prices which (largely) reflect the cost of the fabric. This may seem odd to some, but it actually comes across as quite fair — basic fabrics that move quickly are cheaper, while the fancier fabrics tend to be pricier. The fabric variety is absolutely insane, which should please even the pickiest of the sartorially inclined. It should surprise absolutely no-one that Modern Tailor has its clothing made in China. This isn’t itself a problem: most clothiers make their clothing in some foreign country. Still, because you are ordering made-to-measure directly from the factory, this means that shipping can take what feels like forever. In my personal experience, shipping took approximately one and a half weeks, and it arrived entirely in one piece with not a visible scuff mark on it. As someone who has ordered numerous times from foreign countries, this is actually quite surprising — even small orders from Japan can take upwards of two weeks or more depending on the item. Despite how impressed I was with the shipping speed from Modern Tailor, one obvious flaw stuck out: the tracking of my package. 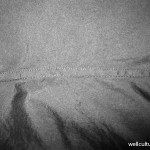 As Modern Tailor apparently uses a Chinese shipping company to deliver their items, tracking is conducted by strange Chinese websites that rarely load. Modern Tailor also sent me two websites — http://www.sxyexpress.cn/ and http://en.ald365.com/ — to track the same order, thoroughly confusing the hell out of me (as neither could actually track my package). So the message here is simple: you’ll get your package relatively quickly and in good shape, but don’t expect to know where your package is at any given time before it arrives at your doorstep. Before I begin nitpicking the hell out of the shirt I received from Modern Tailor, allow me to explain precisely what I purchased (and what I did before reviewing). 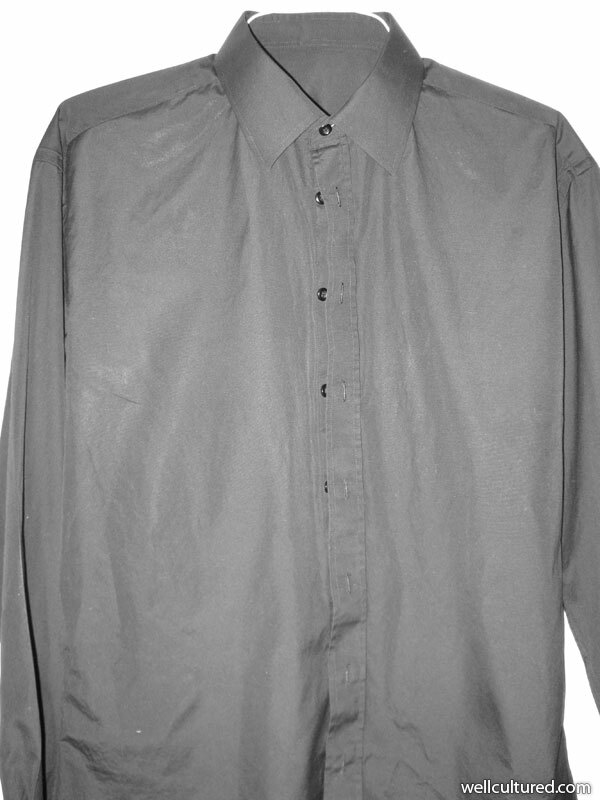 First, the shirt I ordered was a simple trial black shirt with a basic collar (“Classic (Back Height 3.7 cm, collar point 7.5 cm) / Stiff“), with no pocket, barrel cuffs with two buttons, and no placket. The shirt was given with my personal measurements, which are highly unusual (I have a massive, 4″+ disparity between my chest and my waist due to weight lifting), in order to test how Modern Tailor handled an unusual order. A very important caveat about the above: this shirt is the trial shirt made available in early 2012 for evaluation by those trying out Modern Tailor for the first time. Accordingly, Modern Tailor made it clear well in advance that this fabric is not of the quality of their regular shirts — it is intentionally cheap, and really apparently meant to serve as a guide for future (pricier) orders. That being said, this review will not focus too heavily on fabric quality, though I will note that even their “cheap” fabric is notably better than other cheaper brands I have reviewed before (specifically, Gap, Express, the cheaper Banana Republic line, etc). 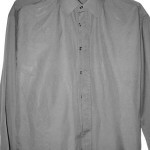 In order to conduct a very basic test the shirt’s durability, it was washed twice on a gentle cycle and hang-dried. 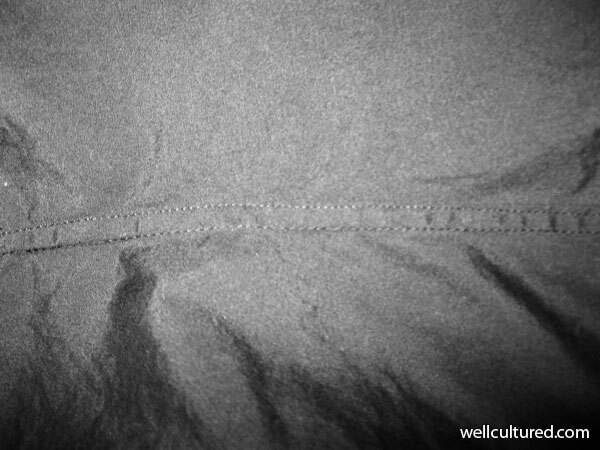 It was ironed before photography with starch, which partially accounts for some of the light white marks and unusual shininess in the photographs below. Modern Tailor may not produce the best made shirts in the world, but their shirts are so damn good they may very well have saved me from the cult of Brooks Brothers shirts. As a preliminary matter, the Modern Tailor shirt I got was surprisingly well made. 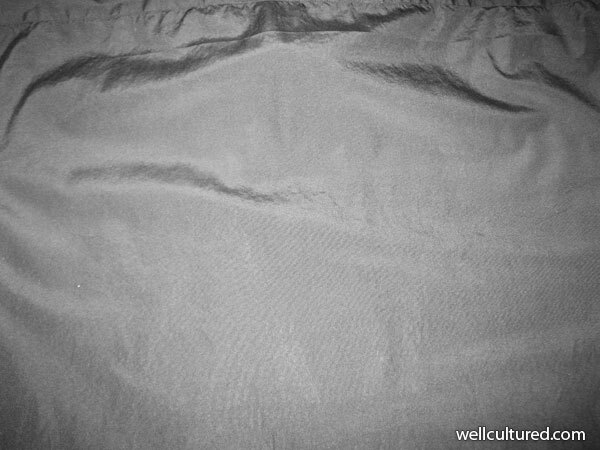 While the fabric itself was fairly basic (see above — this was a trial shirt with intentionally cheap fabric), the fabric was stiff and well made where it really counted. 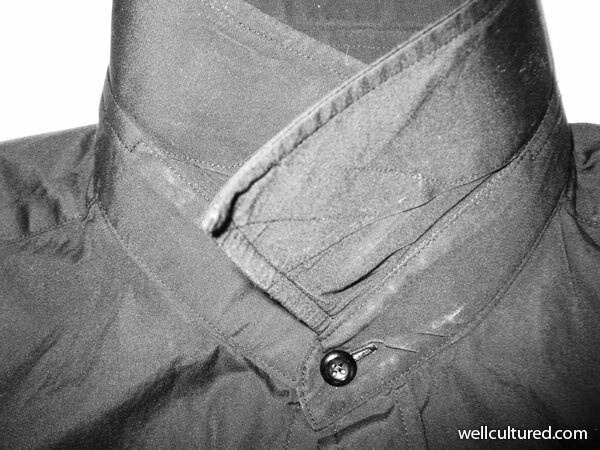 The collar was just as stiff as a high-end Brooks Brothers shirt, making collar stays almost unnecessary. The cuffs were well made and firm, though not abrasive to the wrists. Generally, everything felt like a high end shirt from a high-end clothier — a surprising development, considering the shirt was made in a random factory in China. The stitching is also impressive. While most stitching (especially on made-to-measure shirts) is quite poor, particularly where customers do not look, most of the stitching on Modern Tailor’s shirt is solid, well-done, and without perceivable deviation or error. Even with my ridiculous proportions (which typically lend tailors some issue), the stitching is clean-looking and well-done. With the exception of the buttons (see below), everything feels solid as a rock. I hate to continue the incessant comparisons to Brooks Brothers, but it’s hard to not make the comparison here — the shirt is as well made as a Brooks Brothers shirt, and even might trump Brooks Brothers’ cheaper 346 line for the most part. 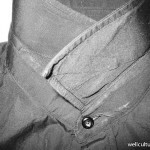 The one place the shirt falls apart is in the buttons, though this issue is minor (if existent at all). For whatever reason, the stitching on the buttons and button-holes of the shirt I received is slightly messy. While there is no indication that either the buttons or button-holes will fall apart any time soon, it appears that the buttons and button-holes were done in haste, which left some stray threads. This is an issue with a huge number of shirts, even those off-the-rack, but it is worthy of note — it may be worth spending some time with a small pair of scissors fixing the minor issues yourself. In terms of wear, due to the cheapness of the fabric (which is, again, expected due to the fact this is a trial shirt), the shirt wears very well and actually manages to feel remarkably solid. With the right fabric (and shoulder size, see below), this shirt would unquestionably be a staple of my wardrobe. In terms of measuring and fit, I was both pleasantly surprised and slightly disappointed. 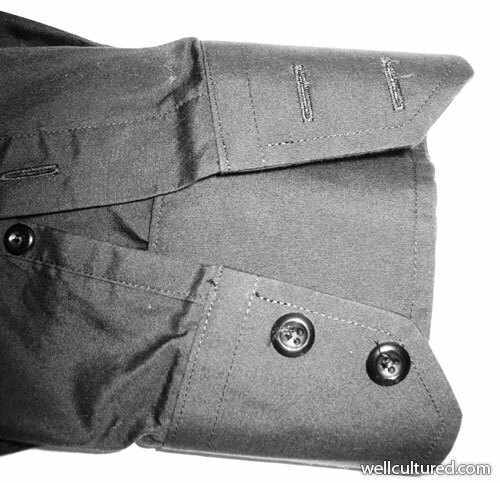 As a general matter, the shirt was tailored impeccably, with every small size change I requested accounted for. However, for some odd reason (likely due to my own error), the shoulder size on my shirt was over an inch too large, rendering the shirt too baggy for me to wear without feeling ridiculous. This may be an unfortunate result of my own attempts at self-measuring — accordingly, it may be worth your time to simply measure a tailored shirt that fits you well. Nonetheless, the sheer fact that I’m disappointed I can’t wear this shirt speaks to how highly I think of its tailoring: were it not for the shoulder issue, I would happily wear this shirt as much as humanly possible, cheap fabric be damned. So, the million dollar question is, should you get a Modern Tailor shirt? The answer is yes, but there are some caveats. If you are someone who needs custom-made shirts and want to skip the process of getting an off-the-rack shirt tailored, then Modern Tailors’ shirts will be your godsend. Modern Tailor shirts are far from cheap (shirts start at $60 and only go higher), but in comparison to the average cost of getting a high quality shirt from Brooks Brothers purchased and tailored (~$80 for the shirt plus $10-20 for tailoring), Modern Tailor’s price is not exorbitant. 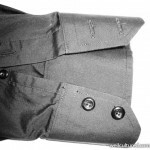 That being said, if you are fairly skinny or just don’t need a high-end dress shirt, Modern Tailor may not be for you. Because many clothiers (especially trendier/younger brands) are now adjusting their sizing to fit slimmer builds, it obviously makes no sense to pay upwards of $60 for a shirt when you can get something relatively well-fitting for cheaper. This applies doubly if you don’t need a dress shirt often, for obvious reasons. So the takeaway here is pretty obvious: if you are already plunking down over $50 for tailored dress shirts, or would like to do so in the near future, Modern Tailor is almost as good as Brooks Brothers in terms of construction quality and general style. 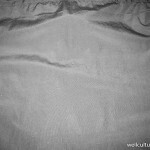 If you are willing to take the risks of measurement and ordering from China, Modern Tailors’ products are damn fine.